The biennial APEX gathering unites a wide spectrum of international music artists, experimenters and collaborators from across the realms of noise, drone, industrial, power electronics and more. The 2015 installation promises to be one of the most damaging lineups, with a monstrous array of artists from across the smoldering globe together, with APEX VI now confirmed to run from June 5th through 7th. 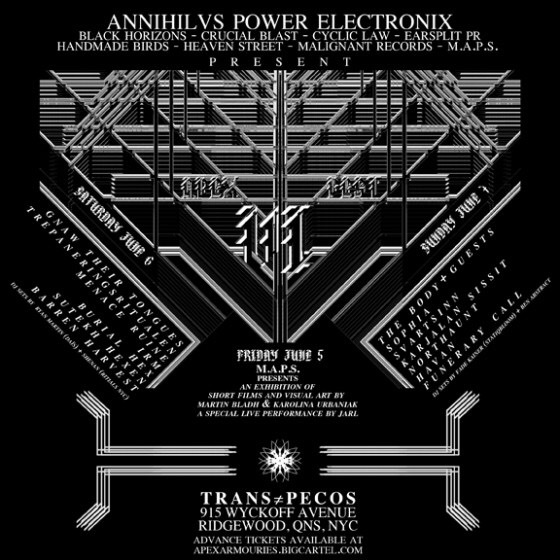 Presented by ANNIHILVS POWER ELECTRONIX in association with BLACK HORIZONS, CRUCIAL BLAST, CYCLIC LAW, EARSPLIT PR, HANDMADE BIRDS, HEAVEN STREET, MALIGNANT RECORDS and M.A.P.S., the APEX VI gala will take over Trans Pecos in Ridgewood, Queens. While the three-day lineup is not fully complete or announced, the list of confirmed acts is already set to include Portland doom cult, THE BODY (including guest collaborators to be announced), the second stateside performance from Dutch maniac GNAW THEIR TONGUES, the first appearance from Sweden’s IRM in ten years, since playing at the first APEX in June 2005, as well as TREPANERINGSRITUALEN, MENACE RUINE, BURIAL HEX, SUTEKH HEXEN, SVARTSINN and many others hailing from Sweden, Norway, Canada and abroad, in addition to short films and visual works presentations, exclusive merch/vendor wares and much more. Advance tickets and multi-day bundles — including a fest compilation digipak CD and exclusive t-shirt designs from GNAW THEIR TOUNGES and THE BODY — have been posted. View the entire confirmed lineup as of now, all ticketing options, the official event page and more below, and stand by for further promotions and announcements as APEX VI is finalized.